Now of New York, U.S.A.
Monahan's Bicycle & Plumbing Shop circa 1956 (time Tom was emigrating to the States. House next door is where Tom was born. Tom's brother Sean. Both brothers worked for their Dad. Oughterard Pioneer Association. Mick Monahan presenting a cheque to Canon Mc Cullagh on behalf of the Association. 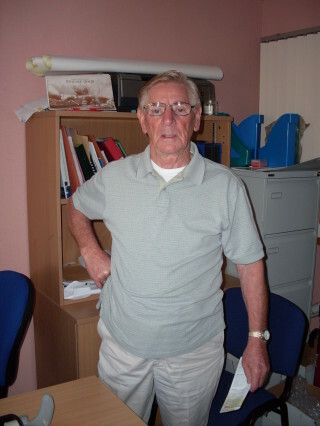 Tom Monahan was born in Oughterard (in 1936) one of five children born to Michael and Norah Monahan. 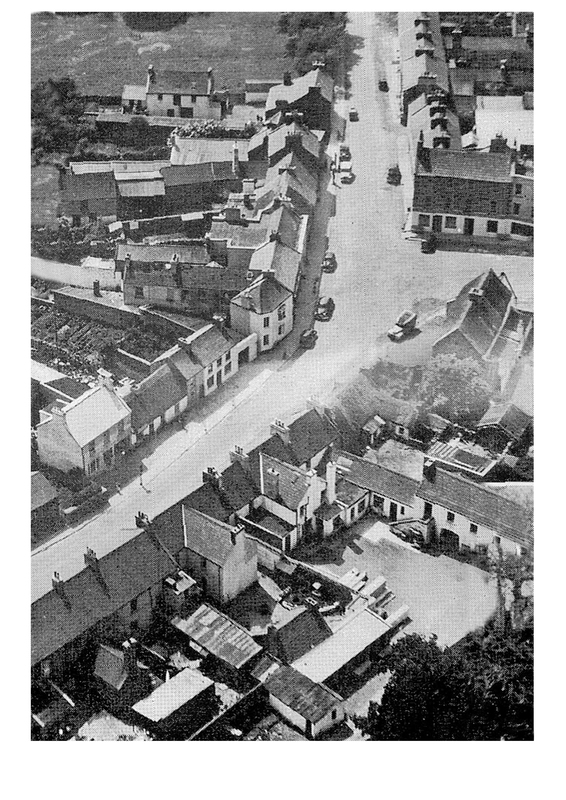 His father Michael was born in Cappataggle near Ballinasloe and his mother Norah O’Halloran was born in Cornellistrum 7 miles from the town of Oughterard. 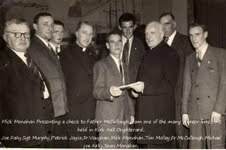 Mick Monahan (as his friends knew him) tried his hand at many a venture. He joined the Irish Free State army in 1922-1924. He opened up a butcher shop in Esker, Rosscahill where his son Sean was born . The family then moved to Glann where Mick opened up a grocery shop. 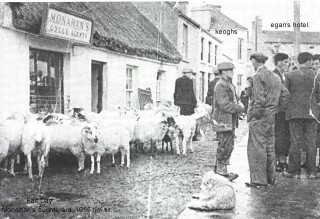 Later they moved to Oughterard. Mick rented a two-room house attached to the Harris house, now owned by Henry Keogh (see picture).Tom was born in this small house. Mick later bought the present Monahan’s house from the Walsh sister Delia and Babes. Mick started up a bicycle repair shop and later expanded it to a hardware and plumbing supply shop (see picture). Norah Monahan ran the shop while Mick started up a building contracting company. He employed up to 40 people at various times and built many houses around the area. Mick Monahan was an adventurous and hard working person. Tom remembers himself and his brother Sean helping their Dad build a Windcharger. This provided them with Electricity until the power came to Oughterard.” Necessity is the mother of an invention”. Mick repaired watches on the kitchen table with candle light, so the newfound light was a great improvement. A reporter from the Connaught Tribune (Mr. King) wrote an article on Mick’s wind charger He was so fascinated by it, that he wanted Mick to build one for him. Mick was also a good step dancer.. At a Feis on the platform in Ross Railway Station, he won a step dancing competition even though he had a few drinks before hand ! Mick Monahan struggled for a long time with the curse of drink. He always said “Drink is a curse. It’s so easy to start and so very hard to stop”. He would give up drink from time to time, but it always seemed to have the upper hand. Then one day he decided to quit drinking for good. He started the Oughterard Pioneer Association, which was first sanctioned on March 17 th 1943. Tom asked his father one time, why he decided to quit drinking. His father replied,” I loved your mother too much to lose her”. Tom had cousins in Kansas City who used to send packages of clothes for Mick’s family. Tom described being in awe of the American Flag which was on the collar label on most of the clothes. It also said, “Made in America”. Tom’s uncle had done well in the States. He went to night school and became an Engineer. 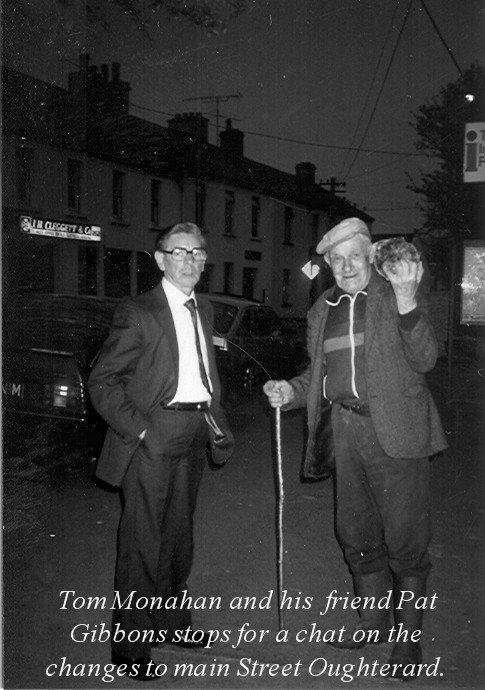 When he was vacationing in Oughterard, he would buy drinks for a few people in Joyce’s pub (Hollands). Tom’s Dad tagged along and always ordered a stone beer (a non-alcoholic drink). Tom’s uncle never took the change from the counter until he was ready to leave the pub. That is when Tom was convinced that the US was the place to go to “make the money”. 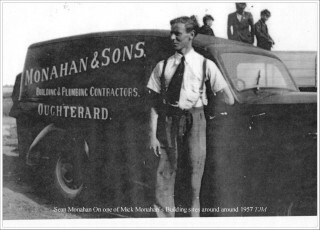 Tom left Oughterard for New York at the young of 22 where he eventually set up his own business, “Plumbing, Heating & Air-Conditioning” having several trucks on the road. Two of his children took over the business after he retired. The night before he left for the States, so many people stopped into his Dad’s house to say goodbye to him. Some people asked him to take over gifts to their friends in New York. He will never forget this one friend Bartley McGauley, who went out fishing that day in order to catch a trout to send to Tom’s uncle in New York. He had it so nicely wrapped in rushes and tied with string. Bartley said,” I want you to give this fish to your uncle as he and I are very good friends”. Tom put the fish in his suitcase( it was about the only thing in the case). Tom’s Dad said, “It’s no use sending coal to Newcastle”. Well, the weather was very hot when Tom arrived in New York. Tom was so excited he put the suitcase in his bedroom and forgot about it for a few days. When unexpectedly his uncle said ,”Tom did you shower today there seems to be a bad smell in your room”. That is when Tom remembered the fish which had cooked in the suitcase from the heat!!! Tom is a Vietnam Veteran. He met his first wife coming from Church & was married within 12 months of arriving in America. They had five children. He had a tough time when he was looking for work. He mentioned his cousin Matt O’ Connor, from Porridge town, and his lovely wife Barbara Nee from Oughterard. With friends like that, Tom said ,” I could conquer the world”. When Tom was heading for the States his father took him aside at Shannon airport and said I will give you a little advice for you future. “If and when you do work for people, a new customer will never ask how much it cost or how long it took to do the job but remember they will always ask “Who did that job “. So always do a good job. Tommie had a lot of tragedy in his life. His first wife and the mother of his five children died of cancer. His second wife was killed in a car accident in Florida. Tommy remarried a Lovely Leitrim Lass named Margaret. Tom has written a book Called “From Galway to New York” for his Children and Grandchildren so they know their heritage. Tommy also does genealogy and is amazed at all the people that left Oughterard sometimes five and six on one ship, headed for all parts of the world. “I would not trade growing up in Oughterard for all the money in the world. Back then you knew people for miles around and there was never a door locked and always a kettle on the boil & you did not have to be invited into anyones house, you just put your thumb on the latch and entered the house with a saying “God Bless all here”. This page was added on 11/11/2010. What are the chances of a young man finding a picture of his grandfather’s house three thousand miles away in a library filled with books, each book having up to five hundred pages, and opening it to the page with the picture you have posted? Tom Hope you have enjoyed my articles on the Railway Cottage – I am not only related to the Stewarts of Mahermaore but the Keneavys of Billamore. Live just up the road in Southbury, and Owen Mc Donnell is probably a mutal friend. Well now, that is a lovely story full of facts and humor! I love the fish to America story. It is so rewarding for members of the Oughterard Culture and Heritage group when people like Tommy share their memories with us. We too cherish the life that the sheer beauty of Oughterard, its people and its environs has offered to all of us and our families who have come to live here.